After a humid Bordspel event in Hoogvliet, we have now a few very nice days. Great weather to go out Geocaching. This time, we have a number of nice new coins and tags. We also added caps with sealrings to the PETling sets. Great for the FTF. This wonderful abstract rendering of the Chinese Zodiac Tiger is super detailed, and like any good tiger blends into it's surroundings. The Tiger's characteristics are bravery, competitiveness, and unpredictability. On the backside is the Chinese Zodiac calendar, with all 12 signs represented. This coin is sure to find a place at the top of your collection. This is the"Joker" from the Royal Playing Cards series. A.k.a. "the fool", "de nar" the "nave", the "Jester" or The Wild Card. In this case it also means the one who is so addicted to caching that they are a "Caching Fool". Getting up early to search for FTF's, doing power caching runs to raise their numbers and attending caching events to compare notes with other cachers. If Aliens knew how cool Geocaching is they'd be swarming our planet just to get in on it. Or maybe *we* are a leg in a giant cosmic multi cache! In any case, it's fun to think about. This coin may not travel to the distant reaches of the universe, but we hope this coin will make a good traveller out in our Geocaching world. Enjoy the changes in the different seasons with this "Fall Leaf Pendant. 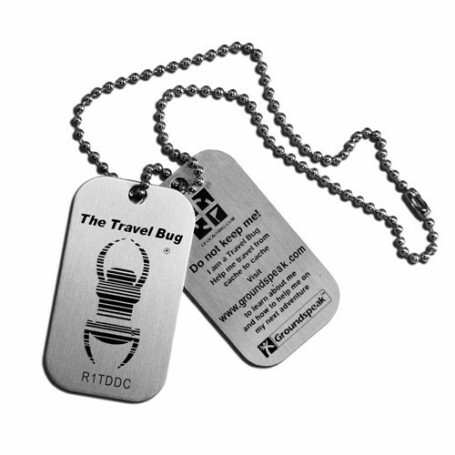 This pendant is a trackable geocoin. Available in red transparent. Funny new travelers of OIly the orca and Bamboo the panda. For our PETling sets we have now caps available with a sealring. This sealring is broken by the FTF. If you pruchased a PETlings set recently, please let us know, you will get the caps for free with your next order. Check here for the PETling sets. Check here for all our pins. For more information on our presence at events, you can look at our event calendar.